Please refer to our stock # 200 when inquiring. This gorgeous vintage pin was designed by Iradj Moini for the couture house of Oscar de la Renta. 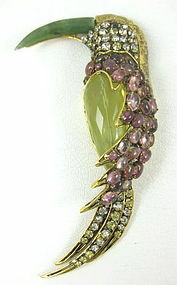 It is 5" long x 2 1/2" wide and is made from gilt brass with citrine, jade, amethyst, tourmaline, and crystal stones. It has a double pin stem on the reverse and it's signed "Iradj Moini" across the beak. It is in excellent condition.